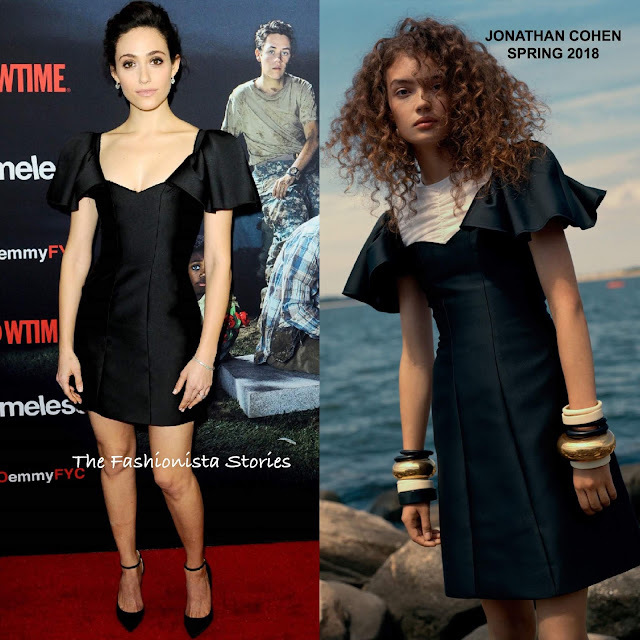 It's been a while since I have seen Emmy Rossum on the red carpet but the actress returned yesterday(May 24th) for the Emmy For Your Consideration event for Showtime's 'Shameless' at Linwood Dunn Theater in LA. Working an all black look, she wore a JONATHAN COHEN SPRING 2018 black mini dress with ruffle sleeves. While Emmy could have easily added a red lip or wore embellished sandals here, I do like the simplicity of her look. Overall, it's on the safe side but it is not a bad look. Beauty wise, she went with an complimentary up-do and a light smokey eye which was offset with a pink lip. A diamond bracelet & studs and black JIMMY CHOO ankle strap pumps finished up her look.